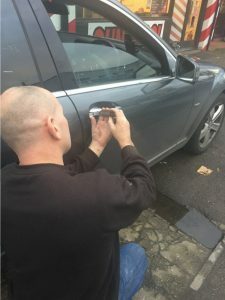 Car Locksmith in Rayleigh? 07708 759815. Lost / Replacement Car Keys? o you need a Car locksmith in Rayleigh? Do you need Replacement Car keys in Rayleigh? Have you lost your car keys in Rayleigh? Are you Locked out in Rayleigh?Your number one Essex based car locksmith can help. We offer a 24 Hour 7 days a week emergency service covering the Essex county and surrounding areas. We have extensive experience with most makes of car or van. From a spare remote key to a faulty car or van lock. At Car locksmith Rayleigh. We can be with you in the shortest of time frames as we have experienced car locksmiths based near you. Some of the vehicles we specialise in are Audi, Ford, Peugeot, Renault, Volkswagen and Vauxhall, just to name a few but we can cover most other makes of vehicle including commercial vans and trucks. Some of the services offered are listed below. But if you do not find the service you require please call as we are sure we will be able to help you in some way. So if you or one of your family and friends need local Essex based locksmith we can help call now on. 07708 759815 to speak directly to an experienced Car Locksmith.